Over the last few years I’ve been keeping my eyes on North American bike brand Traitor, and more specifically their ‘Slot’; a steel mountain bike designed for off-road touring. It’s a no-fuss rigid adventure rig with a wide gear range, cable disc brakes, 2.1″ tyres and provision for front/rear racks and fenders. It’s pretty rad. 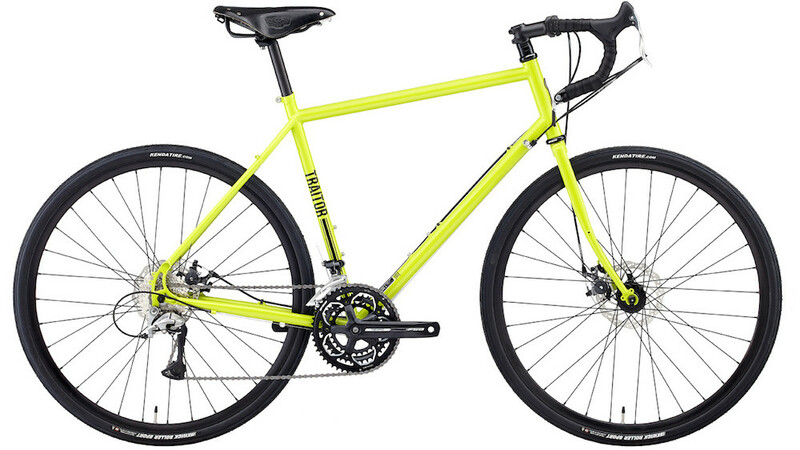 It’s now come to my attention that Traitor are producing a dedicated touring bike called the 2016 Traitor Wander and it’s made with seamless double butted steel tubing. The 2016 Traitor Wander Touring Bike. The geometry of the Wander is great for touring with a front and rear load. The bike has a moderate fork trail of 68mm (learn what that means HERE) resulting in a slowish steering response, keeping heavy loads stable on fast descents. 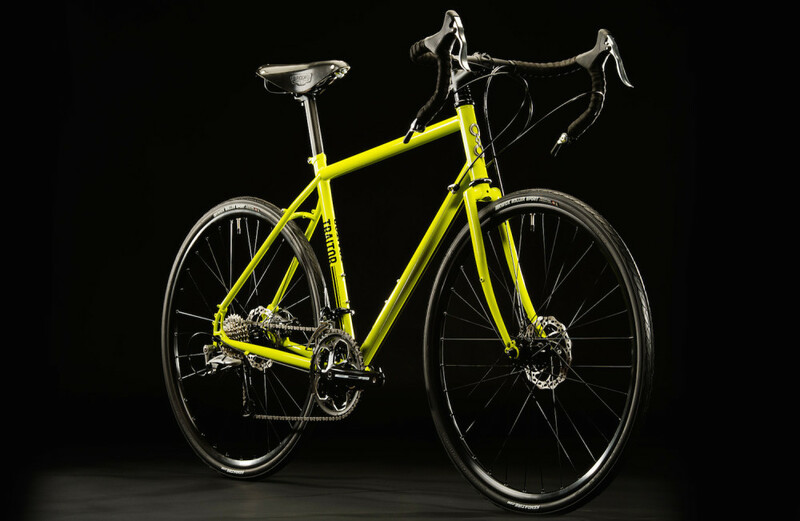 The bottom bracket is low and the chainstays are relatively long too – although the bike could be improved if they were a touch longer. The bike comes with rather narrow 32c Kenda Kwick tyres and will squeeze in 40c tyres without fenders (35c with fenders). A strange specification on the Wander is the gearing. The smallest gear on the Shimano drivetrain is 30x30t (27 gear inches). It is widely regarded that a gear this small is simply not enough for bicycle touring. If the bike was spec’d with a Shimano Deore 48-36-26 crankset and 11-34t cassette it could achieve a low gear of 21 gear inches. If you’re thinking this could be the bike for you, perhaps take into account the cost of these potential upgrades: up to $200 in parts. 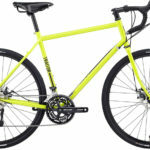 The Wander is available in fluro yellow, and comes spec’d with decent parts including a Brooks B17 saddle, Promax Render cable disc brakes, Microtech 9-speed barend shifters, their own branded 32 hole disc wheelset (Joytech hubs), a FSA Tempo crankset and Shimano gearing. Another improvement to this bike could be the provision for a third bidon cage under the downtube like on many equivalent touring bikes. 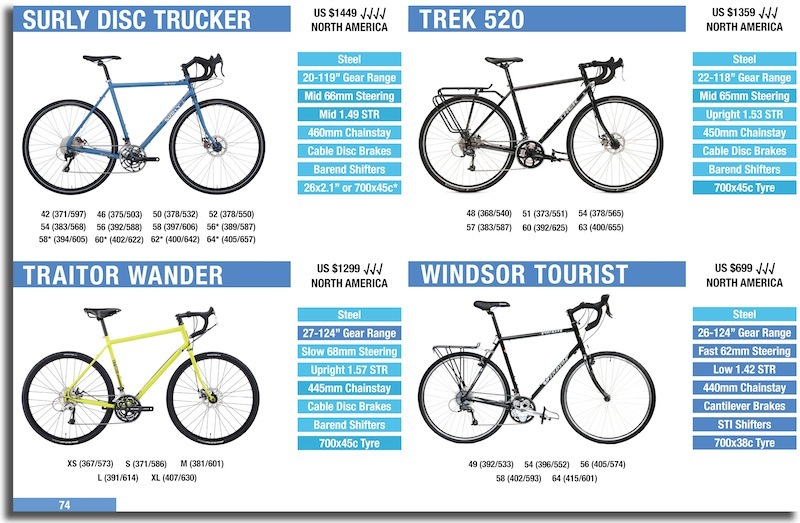 The bike comes in five different sizes and the range is great. It covers the equivalent of everything from 42-62cm on the Surly Truckers. The Traitor Wander retails for US $1299. You can get the frame/fork for US $499 too.